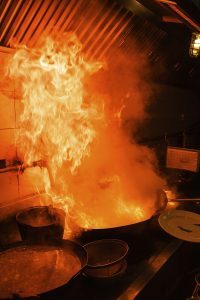 Preventing a business fire is easier than you think! The last thing your business needs is to clean up after a fire. Fires can start in a variety of ways. According to the United States Fire Administration (USFA), most commercial fires destroy businesses when there aren’t any fire sprinkler systems installed. Therefore, the importance of having properly installed fire sprinkler systems becomes a critical component of any commercial fire safety plan. There are a variety of benefits that come with installing fire sprinkler systems in your business. One of the biggest reasons your business will benefit from a fire sprinkler system is that you get water only when there is a need for it. Fire sprinkler systems use technology that handles the dispersing of water swiftly and efficiently. When necessary, as in the case of a fire emergency, your fire sprinkler system will be activated and begin dispersing the proper amount of water to avoid your business from literally going up in flames. An important component to being prepared in a fire emergency situation is the regular maintenance and upkeep of your fire sprinkler system. Every state has it’s own regulations when it comes to regulating the requirements of commercial fire sprinkler systems. However, it is critical for your business to make sure that you schedule a regular check by a professional who can investigate whether your fire sprinkler system is working properly. Maintenance checks provide you with an opportunity to fix possible malfunctions or other lingering issues in your fire sprinkler system that could use a repair. With a wide array of customers, we can help you find the best fire sprinkler system for your specific business. This entry was posted on Monday, April 17th, 2017 at 1:36 pm. Both comments and pings are currently closed.